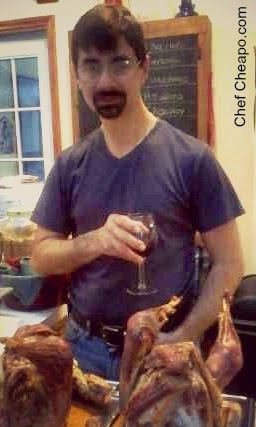 Chef Cheapo: They call me, "the meat man" !! This post has a double edged sword to it. It will require you to spend some money up front, but it will save you money and give you better food in the end. One of the best tools in my kitchen is my Kitchenaid mixer. Mine allows me to use attachments to it for different tasks. There is a plug cover that comes off and the attachment goes into the body of the mixer. I have had my mixer for many years now and I have a meat grinder attachment that I found early on. It generally cost around $80 for this attachment, but one money saving way is to look for it on EBay, yard sales or thrift stores. I found mine in a thrift store for $10 and it is cast aluminum, not plastic. In the past year, I went out and bought a meat grinder that Lowes Hardware sells. That is all it does- grind meat. It was on sale for 20 % off, the last one they had was the floor model and they gave me another 10% off and I got a $20 rebate to boot. Now THAT’S a bargain hunter for you. With the sale pricing and the amount of meat I will grind, I figured it would be worth it. So, why should you want to grind your own meat? You will be amazed at how much money you will be saving and how the quality difference is from store bought ground meat. Most commercial ground meat (beef) comes from a factory butcher that processes thousands of animals a day. All of the non-prime cuts and bone scrapings become ground beef. The mixture of this meat from the thousands of animals is what has brought out the meat recalls over the years from ecoli and salmonella. In addition to the safety of the meat, there is the question of quality. The ground meat has been ground and “refreshed” several times by the time you have purchased it, allowing more fat than may be labeled to be added. By regrinding the meat, it also makes it look fresher. Another trend the meat industry is using as of late is prepackaging the ground meat at the factory so the store has nothing to do with it. Check the ingredient label on these prepacked meats. You will see many of them have “additional flavoring added”. Why would meat need extra flavoring? Additionally, something to watch out for that has become prevalent in the meat industry the past couple years is the practice of adding “flavor enhancers” “broth” or some other synonym for ADDED WATER. Basically, that’s what you’re getting- WATER, and usually it is some salt derivative water. So not only are you paying more for a hunk of meat that has additional water weight, but the water added is salt water and will add salt to your diet. The industry does this these days to cut costs. The cost is rising and people aren’t going to keep paying more for meat, so they must find some way to cut costs. If this meat is so good, why do people pay top dollar for a steak at Ruth’s Chris? RC offers AGED beef, or beef that has dehydrated, or lost water weight to some degree to concentrate the beef flavor. When you grind your own, YOU have the control. You know better what you are eating and the quality of the meat as well. You bring the chance of contamination down greatly. Ecoli thrives in the moist environment of the ground meat, not as well on the surface of a roast, so if you start with a hunk of meat, less contamination. I will wait until I see CHUCK ROAST on sale. This will give you a good moist ground beef that will make great flavored hamburgers. If you plan to use the ground beef in recipe like burrito, tacos, meat loaf, etc., you can use a leaner cut of meat, like eye round, sirloin, and rump roast. Ground beef sells for anywhere from $2.59 (on sale) to $4.50 a pound. I have seen chuck roast on sale for $1.89/pound. Here's the money savings! Buy the roast, cut into cubes to fit into the grinder, grind, weigh, and use. I will buy 10-20 pounds at a time and portion into 2 pounds per quart Ziploc bag and freeze and use as needed throughout the month. Using chuck roast will yield you 80% lean, 20% fat ground beef, perfect for hamburgers. Eye round, sirloin and rump roast will be about equal to 93% lean. Fat is not the enemy here. When you cook the ground beef, the fat will melt off and you can drain it off if that is a concern for you. I have also been fortunate enough to get venison from local hunters every autumn. Most will gladly give it away, so what they are harvesting has some use. This makes EXCELLENT meat, for everything you would use beef for. Most people will not tell the difference if not told. Same thing for other meat- chicken, pork. Buy it cheap, grind your own and save money.